Land is everything to many poor people. It is a means of survival. Taking it away from people who depend on it to produce food to feed their families is equal to condemning them to a life of poverty. This was why the democratic government of 1994 started the land reform programme. It was aimed at giving people who have no land ownership rights to a piece of land. 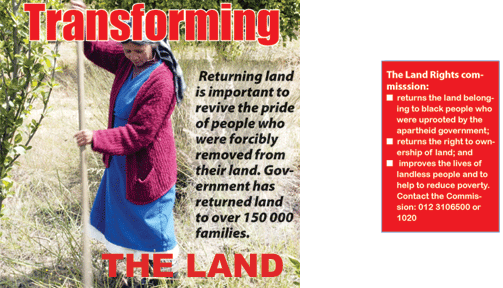 Another programme was the restitution of land rights – its purpose was to return people who had been forcibly removed from their land under apartheid to their land. The Commission on Land Rights was set up to deal with these issues. Since the commission was formed it has received 79 696 land claims of which 59 345 claims had been settled. The Chief Land Claims commissioner Tozi Gwanya told Vuk’uzenzele that the return of land was important to revive the pride of people who were forcibly removed from their land. In the next nine years, he said, the government will have provided 30% of agricultural land to black farmers. “The government has also paid millions of rands to people whose land could not be returned because it was turned into an industrial area (where factories were built) or houses have been built,” he said. Gwanya said before 1994, 87% of land was owned by white people, whereas only 13% was in the hands of black people. “We have managed to return the land belonging to 172 769 families. This has been an important achievement,” he said. The cut-off date for land claimants was December 1998. And December 2004 was the date by which all claims should have been resolved, but this was extended so that the remaining claims could be dealt with.Gwanya said he did not believe the land claims process would be reopened because it would cost a lot. So far, the commission has given 887 093 hectares of land to people who have applied to have their land back. “We are sure the remaining claims will be solved in the next three years,” he said. In July 2005, the government organised the Land Summit in Johannesburg. The meeting was attended by several community-based groups and leaders of political parties. It was at this meeting that the Agriculture and Land Affairs Minister Thoko Didiza pro- mised that unfair forced removals would remain something of the past. Didiza said in the first years of democracy the government had created laws to speed up the return of land to its rightful owners. “Since 1994 the government has given 1,2 million people more than 3 million hectares of land through the Land Reform programme,” she said.